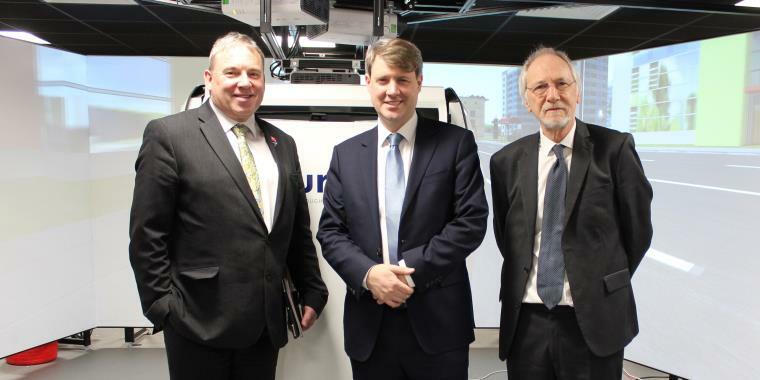 Chris Skidmore MP, Minister of State for Universities, Science, Research and Innovation, toured Bristol Robotics Laboratory (BRL) and the University Enterprise Zone (UEZ) as part of a visit to UWE Bristol. The minister, MP for Kingswood, met UWE Bristol Vice-Chancellor Professor Steve West and BRL Director Professor Chris Melhuish during the visit earlier today (Fri 22 March). He received a guided tour of the UEZ after last month announcing £10 million would be available for up to 10 new similar zones to be established at universities in England. UWE Bristol's UEZ - an enterprise ecosystem promoting collaboration between the University and industry - was funded during the pilot phase of the UEZ programme launched in 2014. As part of the tour of the UEZ, the minister was accompanied around the Health Technology Hub, Launch Space Incubator, Future Space Innovation Centre, BRL Robotics Innovation Facility and Hardware Incubator. The UEZ hosts business incubators, grow on space and SME support services, and is home to over 70 companies specialising in technology, robotics, automation, health technology and biosciences. In the adjacent BRL, the minister received a tour of the Assisted Robotics Laboratory, Nuclear Decommissioning Suite and Driverless Car Workshop and Simulator. Professor West said: "We were absolutely thrilled to host the minister for his first visit to the University since his appointment in December, and proud to highlight our sector-leading work in Bristol Robotics Laboratory and the University Enterprise Zone. Our unique approach to enterprise is helping to connect entrepreneurs and tech innovators with scientists, researchers and graduate talent; sparking collaboration, innovation and growth." Professor Melhuish said: "It was a great pleasure to show the minister the pioneering work taking place in a university in his neighbouring constituency. At the BRL, we have a track record of successful innovation and enterprise, and enabling dynamic start-ups including Reach Robotics and Open Bionics through our Hardware Incubator, which is unique in the UK." Minister Skidmore said: "I was impressed with the excellent facilities at the University of the West of England and to see the fascinating work on the future of robotics. "The University's partnership with enterprising private sector firms is a great example of how our world-class academic communities are helping shape the future of life in the UK. This is at the heart of our modern Industrial Strategy's aims to create highly skilled jobs and boost the economy. "In February, I announced a £10m Research England fund to extend University Enterprise Zones which facilitate interactions between universities and small businesses. Bristol was a very successful part of the pilot for these zones." Minister Skidmore last week announced his plans to set up a new robotics leadership group to ensure government understands the opportunities and helps tackle the barriers to growth in this sector. The ministerial visit was preceded by a visit to the BRL earlier in the day by the Department for International Trade, with senior trade representatives from UK embassies around the world viewing the facility as part of an Advanced Manufacturing Sector Knowledge Visit.